This is a compilation of known software for the Norsk Data computers. It contains both programs released by Norsk Data AS and third part programmers. Links to online resources and references to where copies could be found should also be included. NOTIS, a text processing system. NORD-TSS, Time Share System, an early operating system with timesharing. There are a lot of floppy images at Datormuseum.se For a detailed description use the link above. These programs have been stripped for easy loading as binary only by the nd100emu ND100 emulator project, the start address is in the name. CAT Common Abstract Tree Language. R. Voeller & Uwe Schmidt, U Kiel, Germany 1983. Universal intermediate language, used by Norsk Data in their family of compilers. 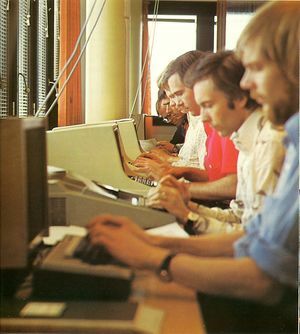 "A Multi-Language Compiler System with Automatically Generated Codegenerators, U. Schmidt et al, SIGPLAN Notices 19(6):202-2121 (June 1984). NODAL Interpreted language implemented on Norsk Data's NORD-10 computers. Used by CERN and DESY high energy physics labs to control their accelerator hardware, PADAC and SEDAC. Included trackball input, graphics. GETNORD Reading NORD diskettes to a CP/M based microcomputer. GETNORD is a member of a set of two programs used for transfer of files between a minicomputer NORD and a CP/M based microcomputer. The programs are particularly well suited for transfer of all sorts of text files, written in international ASCII (or, national adapted ASCII versions). GETNORD runs on a CP/M based microcomputer and will perform reading NORD diskettes, with their 512 bytes sectors and their special directory format. The micro must be equipped with at least one normal 8 inch diskette drive, and its disk controller must be able to take 512 bytes sectors, single density. The companion program is GETCPM, a program running on NORD and able to read diskettes written by a CP/M based microcomputer. The two programs work quite independently, however, and they may be obtained individually. Vendor: Odd Pettersen, Hoemshøgda, 7000 Trondheim, Norway. This page was last modified on 17 June 2018, at 21:39.